The entire installation process took about 90 minutes, but this will depend on the speed of your network connection. Sound and the webcam both work. Multiple screens work in both mirrored and extended modes. 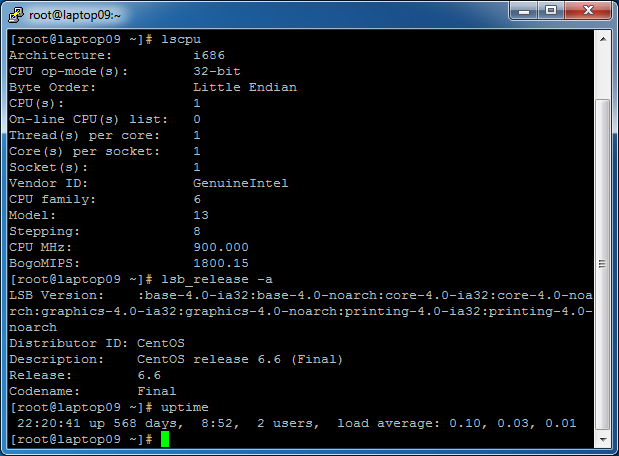 This Asus Eee PC 900HD is now running CentOS 6.6. The update from 6.3 worked fine, but it took a very long time. Be patient. The screenshots are from a video I made. I actually had a video camera pointed at the screen, so the images are a bit wavy. I took the screenshots with VLC and straightened them with GIMP. The battery has kept it up through power glitches. CentOS 7 will most likely require a 64-bit processor, so the Asus will be retiring soon. This entry was posted in Technology on 14 April 2013 by John Miller.